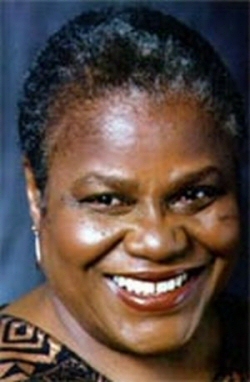 Bernice Johnson Reagon, singer/composer, cultural historian, author, and producer, was born on October 4, 1942 in Dougherty County, Georgia, to Reverend Jessie Johnson and Beatrice Johnson. The third child of eight, she began singing at the age of five in her father’s church. As a high school senior in 1959 she served as secretary to the youth chapter of the National Association for the Advancement of Colored People (NAACP). In 1959 Johnson entered Albany State College in Georgia, where she majored in music. While there, she became one of the student leaders in the Albany Movement, serving as student representative on the Executive Committee. In December 1961 Johnson and 600 other African Americans were arrested for demonstrating against segregated facilities. As a result of their activism, Johnson and 38 fellow students were suspended by the college. In 1962 Johnson became a Student Nonviolent Coordinating Committee (SNCC) Field Secretary, joining SNCC’s Freedom Singers on their first national tour. After her marriage in 1963 to fellow SNCC member, Cordell H. Reagon, and the birth of their children, Toshi and Kwan, Reagon resumed her studies at Spelman College, graduating in 1970. She then went on to do graduate work in history at Howard University, completing her doctoral dissertation on the songs of the Civil Rights Movement. Reagon’s career as a performer began in 1962, when she started working as a solo singer in folk clubs. Her career received a boost when she sang the songs of freedom at a September 1962 folk concert at Carnegie Hall. In 1966, Reagon released her first solo album, Songs of the South, and followed that up in 1967 with her second album, Sound of Thunder. While at Howard, she became the vocal director of the newly formed D.C. Black Repertory Theater. In 1973 she formed Sweet Honey in the Rock, an African American women’s a cappela ensemble. This internationally acclaimed group became known for its repertoire on historical and contemporary struggles for freedom against social, cultural and economic oppression. In 1974 Reagon began working at the Smithsonian Institution, and from 1974 to 1992, she served as director and curator for the Program in African American History at its National Museum of American History. Reagon also served as Distinguished Professor of History at American University from 1993 to 2003. Bernice Reagon has worked on several documentary projects, including the Emmy award-winning Eyes on the Prize and We Shall Overcome. Three of Reagon’s projects received Peabody Awards: Wade in the Water: African American Sacred Music History (National Public Radio and Smithsonian Institution radio series); Africans in America (a PBS film series on slavery); and Beah: A Black Woman Speaks (an HBO film). Several awards recognized Reagon’s pioneering work. She received a MacArthur Fellowship in 1989, followed by the Presidential Medal for contribution to public understanding of the Humanities (1995), Leeway National Award for Women in the Arts (2000), Heinz Award for the Arts and Humanities (2003), and Howard University’s Distinguished Alumni Award in Humanities, Music and Civil Rights (2009). In December 2011 Dr. Reagon was the Commencement speaker at Albany State University. The school and the Georgia Board of Regents paid homage to her and 30 of her fellow expellees with honorary Bachelor degrees. Jessie Carney Smith, Epic Lives: One Hundred Black Women Who Made a Difference (Detroit: Visible Ink Press, 1993); http://www.bernicejohnsonreagon.com/.